A business is only as strong as its collective parts. Make sure all those parts are running full speed ahead with an Equipment Loan from F & M Community Bank. We offer local businesses competitive rates on new and used equipment — plus, budget-friendly terms based on each operation's unique situation. Don't work around slower-than-normal or even lapsed periods of production. An Equipment Loan from F & M allows you to remain fully functional without cutting into working capital or existing savings. 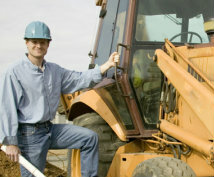 Stay ahead of equipment obsolescence and also of your competition — look to your local bank for an equipment loan today.